Only six minutes of the film. But this first six minutes are already filled with wealth of ideas and images. First, the condition of the print. It is quite apparent that the grayscale of the images are “narrowed”. In another words, the dynamic range has been lost. Black has faded, while white lost its luster. I believe that the surviving material is positive 16mm reduction print. I don’t know if the loss of image quality occurred when this reduction/duplication process was performed, or it has degraded over the course of time. The modern image processing technologies can manipulate images quite easily. In fact, there are some people who are working with old films, giving the image grayscale stretch, adjusting it until they can get “decent details”, and calling it “digital restoration”. While I am not totally against this approach, I am not ready to accept it as definitive. Digitizing analogue materials, especially deteriorated materials, is quite an intricate matter. In any case, rather than appropriating details by manipulating the grayscale, I would study the images as they are, as carefully as possible. A bit of historical background. It will help us to understand some of the aspects in this film. In August 1941, the government issued a warning to Japanese film industry about the inevitable film stock shorting in the near future. During 1930s, most of the Japanese cinemas were shot, processed and distributed with Eastman film stocks. The only domestic supplier, Fuji Photo Film, was considered technically incompetent, and their films stocks were barely used. However, as the war in China was criticized in the international arena, Japan had stepped into the isolationism, resulting in massive material shortage. In 1940, sugar was rationed, no luxurious ornament was allowed and dance halls were shut down. In 1941, all automobiles (except for military use) were converted into coal-fueled cars, and daily necessities, such as rice and alcohol, were rationed. Film stocks were no exception, and in 1941, it became apparent that the commercial use of film stocks had to be restricted, which caused tremendous impact on film industry. There were 10 major studios at the time, but after the executive discussions, they were merged into two studios (Shochiku and Toho) plus one new studio (Daiei). It was decided that there be six features a month (two from each studio), and 30 distribution prints per feature. All movie theaters were categorized into two groups, “Red” and “White”. This war-time emergency measure was taken into effect on the first week of April 1942. “There Was A Father” was the first feature to be premiered in the “White” theaters. The film starts with titles and credits. This title sequence is typical of his works, with minimal design and subdued lettering. In fact, this is very typical of Shochiku cinemas at the time. During the war, it was customary to have propaganda titles before the actual feature. For example, there is a title card “Break the enemy to the end (撃ちてし止まむ)” in the very beginning of many films of this era. I do not know if this film had one of those title cards. The image compositions of the pillow shots in the beginning are significant. First and second sets of the pillow shots are dominated by dark foreground. I tweaked around with its grayscale, and even though the details of the foreground (tree trunks in this case) were lost considerably, they were meant to be a dark foreground in contrast to relatively bright scenery in back. Second pillow shot is undoubtedly the forerunner of that in Tokyo Story as in terms of composition and function in the narrative. There are even sets of large/small barrels/bottles in each shots. Large white walls of the warehouses and higher horizon in the latter bring the image more balanced look compared to dominating trees and very low horizon in “There Was A Father”. Also, very long shadows in “There Was A Father” created by lower altitude of sun indicate bleak early winter morning. 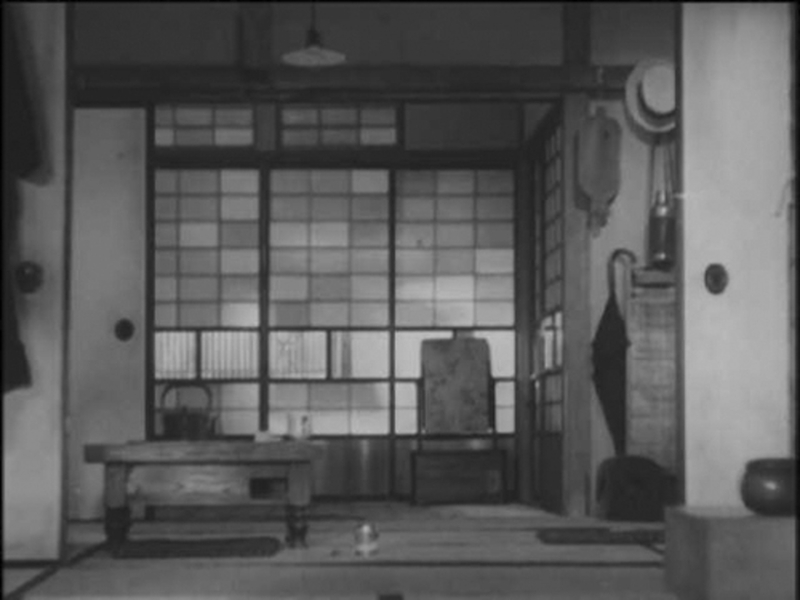 The morning in Horikawa house in “There Was A Father” also resembles the morning in Hirayama house in “Tokyo Story” (come to think of it, these two films resemble each other in many respects). This is the only sequence in the whole film that the father and the son live together in their own house. Since my first viewing, I fell in love with this sequence. This is filled with caring and love only a widowed father would bring. This is built with the finest composition, with bold 180 degree flip. Movement of characters are flawlessly constructed, which culminates into the Chaplin-resque shot of two walking into the bright vanishing point in the early morning. Now the scene Horikawa teaching in the class is the mirror of his son teaching in the later sequence. Here, the prominent blackboard and Horikawa’s dark suits along with student’s dark uniforms dominate the frame. The source of light is from the windows off screen, again with very low altitude. One thing which struck me odd was the manner in which Horikawa speaks of the field trip plan. When he talks about visiting the Imperial Palace, he bows toward certain direction attentively. This gesture is called “Koukyo Youhai (Salute to the Imperial Palace)”, bowing toward the Emperor and his Palace. I thought this custom was very symbolic of the wartime Japan, but not so prevalent in the earlier era. This scene is supposed to be taking place in around 1920, some 20 years prior to the actual film production. I did some reading and found that this gesture was not so strange in 1920s, because Ministry of Education were building its strict teaching policy about Imperial Order around this time. Sudden cut to group photo session in Kamakura is quite striking. Apparently, this cut caused some debate among film reviewers at the time, some citing that audience made uneasy gasps at the premier screenings. Even in the later years, Ozu did not use the cut/transition with the abruptness of this degree. There are many discussion about the aesthetics of this direct cut to next scenes, absence of fade ins and outs or dissolves, but I guess the primary reason for evolution of this technique is what Ozu repeatedly said. He didn’t like the lousy laboratory works in Japan at the time, and these techniques required skill and knowledge only available in Hollywood at the time. He couldn’t stand the idea that his works being destroyed by some incompetent technicians. But apparently, he was experimenting the technique in this instance. While the large Buddha statue in the background, all the students were wearing black uniforms. These uniforms were black. I wore them when I was a kid. So this frame is meant to be occupied by large area of black. And next pillow shot is three tombs of Soga brothers in Hakone/Ashinoko. The story of Soga brothers vengeance was one of the most popular Kabuki and other theatrical materials, in which the brothers swore to avenge his father’s death and after long trying passage of time, they did. Somehow, these tombstones not only foreshadow the tragedy in the lake, but also loom on our father and son. These two shots have quite large power in dark end of spectrum and tombstones are especially significant, in which source of light is off-screen low altitude sun. This shot is extremenly important. Anyone who visited Hakone knew these tombstones. The area where they are located was called “Crossroad to Other World” or simply “the Hell” in the past. My wife and I visited this area many times, and even though the area is now a major tourist attraction, a quite eerie atmosphere is hanging over in the air. Especially, the hours before the sunset evokes the feeling of something of not this world. The pond (“Shojin-Ike”) was nearby, which was looked upon as “Sai no Kawara” in older times. In Japanese traditional beliefs, “Sai no Kawara” is the river bank, water beyond which is the border between ‘this’ and ‘the other’ world (just like Styx). After this shot of tombstones, one of the student drowns in Lake Ashinoko (just nearby) and dies. Yes, this shot is meant to introduce the death. Another point of note is, “Sai no Kawara” has an alternative meaning of “wasted effort” or “working hard in vain”. Perhaps I am reading too much from this detail, but the older generation in Japan instinctively knew those things. I have a feeling Ozu carefully calculated this irony.